In 1981, I was living in Kingston, Ontario, I had fallen in love with Raiders of the Lost Ark, and Return of the Jedi was still a long ways off!! 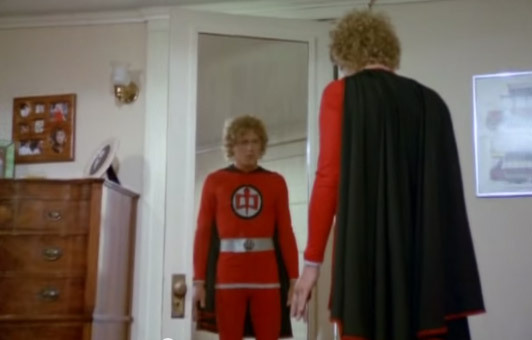 Television, of course, still continued to entertain me, and Stephen j. Cannell was right there keeping an occasional evening occupied with his take on a superhero buddy series The Greatest American Hero, starring William Katt, Robert Culp, and Connie Sellecca. This one premiered on 18 March, 1981 and was written by Cannell, himself. I only remember a handful of episodes from my childhood, but I know it had a huge effect on me, I remember drawing comics, I remember watching the premiere episode with my sister (I think we were home alone that night), I remember the sea monster episode, and I remember that summer, all you heard on the radio was the show’s theme song. So I was very eager to have another look at it. Katt is Ralph Hinkley, single father and high school teacher, who teaches a special ed class for some of the more rough and tumble students, amongst them Tony (Michael Pare) and Rhonda (Faye Grant). He organizes a field trip for his students to the desert so that they can see some sights, and it gets them out of the school, but things go bad when their engine dies, marooning them in the middle of nowhere. Ralph, going for help, bumps into FBI agent Bill Maxwell (Culp), who is trying to find out what has happened to a missing agent… It seems he was investigating something called Gabriel’s Army and disappeared in the desert. The two have a close encounter with a UFO, and the dead agent, who tells them they have been chosen to work together to help mankind. They give Ralph a special suit (though he promptly loses the instruction book), which Bill refers to as jammies, that will essentially turn him into a superhero. The suit itself, will only work on Ralph, so despite thinking he’s the better man for it, Bill has to settle for being the brains. As the plot unravels, Ralph has problems with a custody hearing for his kid, his lawyer, Pam (Sellecca) is just as sweet on him as he is her, but doesn’t believe a word about the suit, and Bill and Ralph find themselves in their first big adventure. It seems Gabriel’s Army is run by some Christian extremists, led by Nelson Corey (G.D. Spradlin), and they have a plan to remove the president allowing the vice-president (Richard Herd, who would menace Faye Grant in just a couple of years on V), whom they control, to become president. Ralph and Bill have to work together, with Pam by their side in her white, convertible, VW bug, to save the day. There are lots of comedic moments, Ralph and Bill’s interactions, learning to use the suit (Ralph never does quite get a handle on landings), tons of Easter eggs (the Super-friends on television, a line that is a direct lift from Superman: The Movie), and lots of fun action as well. All in all a still incredibly enjoyable series, and it’s going to be fun revisiting this one, as Ralph and Bill drive one another crazy, as Bill feels like a dime-store novel G-Man, flag-waving, a little sexist, and patriotic to the core, while Ralph is the modern everyman, a bit of a goof, good intentioned and a strong moral compass. I’m so going to enjoy this journey!